“Tata”,(moms nickname for me)”Isn’t she a beauty?” Funny, but shes not talking about me ;’) but that beauty of our huge avocado. So many different varieties, small, large, smooth, sweet and so many that I actually have eaten with pride. The Avacado is my green gem and my weakness and I still love’em! 7 large shrimp peeled, deveined and cut in half, lengthwise1/2 small tomato, diced1/2 small avocado, spinach (if preffer a different type of lettuce is also great)-cilantro- chives- green onion/scallion- dill ,coconut oil, juice of one lime- crushed red pepper. overnight in order to meld flavors. water when shrimp turns opaque ,set aside. 2. wash and pat dry leaves of spinach and combine herb dressing, halved shrimp, tomato (optional or extras) shredded zucchini. 5. spoon mixture onto the spinach. Refreshing and so delicious. . I love everything about my life…I have a wonderful husband, an amazing son, great family and friends who I love spending time with. The best thing for me is to be thankful for what I have, that is what I have learned so far in my life, and it makes me truly happy! Woke up this morning to the sound of birds singing and chirping, which I love I will admit! The past week I made a decision to start eating paleo, Thanks Again Alia. I was struggling the first 3 days and my mind was taking over, repeating “I’m supposed to be happy yesterday and today…?! ?” over and over, baffled by it, I blamed it on not getting enough sleep the week before, and guess what, I’m human! my goals for the month of April is to revolve around the word ENERGY. (something I can’t get enough of no matter how much I coffee I drink) with zero hesitation I went to the store and shopped for all healthy Ingredients, Meats, Veggies, Fruits, Oils and Coconut water which I already loved. My Energy is starting to awaken more and more each day;-) Makes me happy. 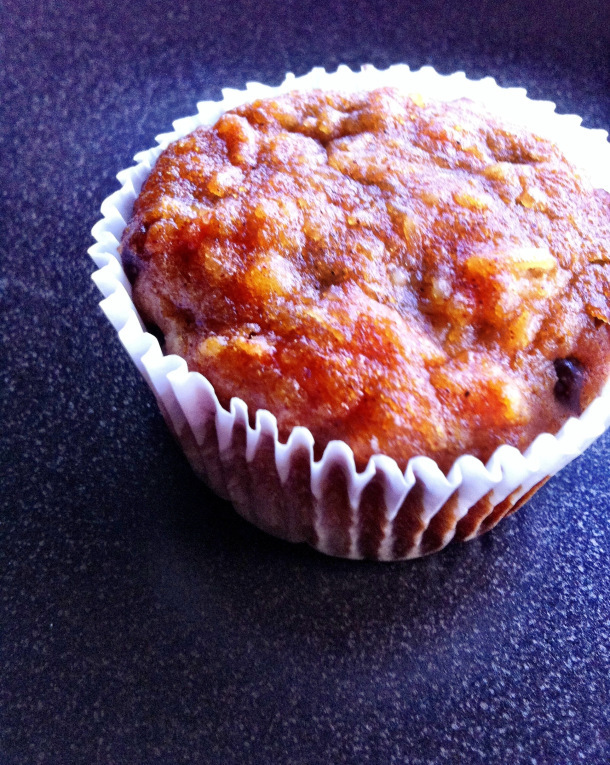 My first posting for a recipe that I started with and would like to share are for “Morning Glory Muffins”. these are incredible. to be honest they taste so good I still feel guilty eating them. 2.Combine all ingredients in a large mixing bowl and blend well. 3.Place 9 muffin cups in muffin tin. 4.Bake for 28-30 minutes or until muffins are cooked all the way through. Change is part of our life journey and I am ready to embrace change and that begins with PALEO. As we all know its hard to deal with big challenges with poor health and low energy and that means more stress and problems to the body. I am ready to focus on the positive and so ready to crank things up a gear!! A sense of wellbeing, more energy and some great sleep sure sounds great to me! With all this said…. I am ready bloggers to read your posts or stories and what inspires you to want to live a better healthier, happier, Life changing you! Before I sign off, Thanks to Alia Paige for creating the TalkPaleo blog site. Awesome Idea and I have to say, that this will be and interesting experience to see in all of you Let the Pledge Begin!